is one of the world's first ultra-premium, mineral rich water packaged in a premium branded bottle. The water is superior in content, taste and purity and offers naturally occurring minerals and vital oxygen that drastically enhance the overall product appeal . will not only emerge as a leader in the growing category of ultra-premium water, based on its inherent characteristics, but will bridge the enhanced and ultra-premium categories together. This gives us the ability to market from two clear platforms for one distinct new product, filling a void while creating a category，and could bring us a more healthy lifestyle. 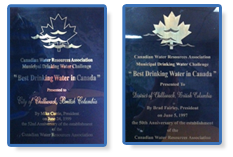 "best drinking water in Canada".